BRUSSELS, Belgium -- The world's top two beer makers agreed Tuesday to join forces to create a company that would control nearly a third of the global market and bring together top U.S. brands Budweiser and Miller Genuine Draft. After turning down five offers, British-based brewer SABMiller accepted in principle an improved takeover bid worth 69 billion pounds ($106 billion) from Anheuser Busch InBev, which along with Budweiser makes Corona, Stella Artois and Beck's. However, the sheer scale of the deal is likely to run into resistance from regulators, notably in the U.S. and China, amid concerns it could stifle competition and decrease choice for consumers. They could force the companies to sell some brands - such as either the Budweiser or Miller brands. Having dismissed previous proposals over the past few weeks as undervaluing the company, the directors of SABMiller unanimously agreed to an offer that values each SABMiller share at 44 pounds. SABMiller's two biggest shareholders, Marlboro owner Altria and Colombia's BevCo would get both cash and shares for their combined 41 percent stake. AB InBev has until Oct. 28 to come up with a formal offer if U.K. regulators grant an extension to the takeover talks. In that time, the two sides will work on the terms and conditions of the takeover offer as well as the financing of the deal. The markets think the deal is now very likely and SABMiller's shares were trading right near the bid price. In early afternoon trading in London, they were up 9 percent at 39.47 pounds. AB InBev's share price was 2 percent higher at 100.30 euros in Brussels. 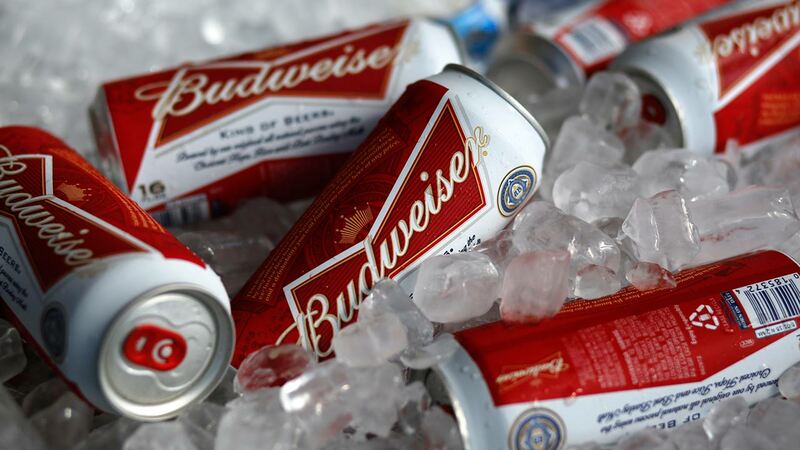 In statements, the two companies said the all-cash offer represents a premium of around 50 percent to SABMiller's share price on Sept. 14, the last trading day before renewed speculation of an approach from AB InBev emerged. According to Tuesday's statements, AB InBev has agreed to pay $3 billion to SABMiller if the deal fails to close because of failure to get regulatory approval or the clearance of AB InBev shareholders. Connor Campbell, a financial analyst at Spreadex, cautioned that a deal "is going to come under intense, potentially deal-ending, scrutiny from regulators." The new company would have annual sales of $73.3 billion and its market share of 31 percent would dwarf that of its next biggest competitor, Heineken, with 9 percent. Market leader AB InBev already has six of the world's largest beer brands. SABMiller, which is based in London, has Peroni, Grolsch and Milwaukee's Best among its stable of beers. For AB InBev, a deal would allow it to bolster its presence in Africa and Australia, where it is not as dominant as it currently is in Europe, North Africa and Asia. The beer industry has been consolidating for the past decade as brewers seek to gain clout with suppliers, distributors and retailers. "The global beer market overall is largely flat and in some regions is declining as other beverages such as wine continue to penetrate," said Professor John Colley of Warwick Business School. "Micro brewers and their highly differentiated cask ales also continue to make progress." AB InBev has a history of making acquisitions and will be looking to find cost savings from the deal as well as more clout with suppliers. Colley says to "expect substantial redundancies" over the coming year, potentially in head offices and country management teams. "AB InBev has both a reputation and demonstrable track record for being able to effectively extract these savings," he said. SABMiller employs 69,000 people in 83 countries. AB InBev has 155,000 workers in 25 countries. Details of the savings have not been published yet and will probably have to wait until a deal is formally agreed upon. Louise Cooper, an independent analyst in London, said one of the consequences of the higher deal price will be more job losses than the original plan may have envisioned. "The more that the bidder offers, the more cost cutting needs to happen to make the deal work financially," she said. "SAB executives have done a good job for their shareholders - and their own executive compensation schemes - by driving up the bid price. But they have not done such a great job for their employees, more of whom will have to lose their jobs."